The University of Venda is located in Thohoyandou, a township in Limpopo. The University was established in 1982 to cater for blacks, in the then homeland of Venda. With the demise of apartheid, the University started focusing on science and technology, and in the year 2002, it became a comprehensive university that offers career-focused programmes. Article 24 requires states parties to ensure accessibility for persons with disabilities in education. Accessibility has three overlapping dimensions: non-discrimination, physical accessibility, and economic accessibility. As such, the University’s implementation of inclusive education can be assessed from these benchmarks. Non-discrimination: This is about the university being inclusive and it is assessed at three levels: its policy, the curriculum, and the psychosocial environment. At policy level, the University’s Strategic Plan 2012- 2016 has “diversity” as one of its key values and it also has “quality teaching and learning” as a second objective. The expansion of its Disability Unit is envisaged. Unfortunately, the University has no specific policy on disability. Regarding the curriculum, the traditional curriculum that encourages formal equality remains unchanged. It is not very flexible, and uses traditional methods of teaching. Classrooms generally do not have enough facilities to accommodate PWDs and, as a result thereof, PWDs can only get their support from the Disability Unit, which also has facilities for partially sighted persons but very little for other forms of disabilities. About the psychosocial environment, only a few lecturers take special care to ask students on their progress. Physical accessibility: This is about infrastructure, classrooms and other facilities available to support learning. New and renovated buildings, like the Block E lecture rooms, the library and the Life Sciences Building have lifts and spaces for wheelchairs; however, the old ones, like the Environmental Sciences Building, and the students hostels do not. On a brighter note, all buildings currently under construction are designed using a user-friendly universal design for PWDs. Economic accessibility: This is about financial support to enable access to education. All disabled students at the University receive disability grants from the Department of Education. The grants cover all their costs including tuition and accommodation. However, the challenge lies in delays experienced in disbursement of funds to such students. 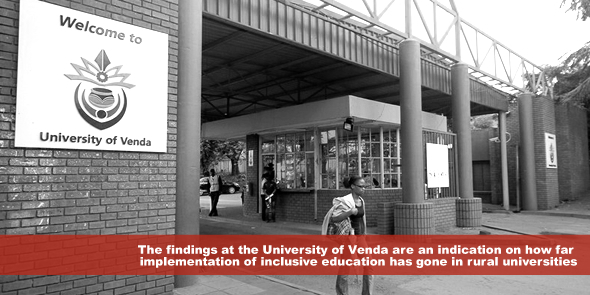 Inclusive education is progressively being realised at the University of Venda, despite it being a rural university. However, using the three parameters mentioned above, it is clear that the standards are still below those set by the CRPD. The findings at the University of Venda are an indication on how far implementation of inclusive education has gone in rural universities. More needs to be done to ensure that even rural universities provide inclusive education to all, if at all South Africa is to live up to its obligations under the CRPD. Adrian Jjuuko is a Ugandan human rights lawyer and advocate. He is the Executive Director of Human Rights Awareness and Promotion Forum (HRAPF). He holds a Bachelors of Law (LLB) degree from the Makerere University, and a postgraduate diploma in Legal Practice from the Law Development Centre, Kampala, Uganda. He is currently an LLM candidate on Human Rights and Democratisation in Africa at the Centre for Human Rights, University of Pretoria, South Africa. His research interests include sexual minorities rights, reproductive health rights and children’s rights.